Who say you can't look good as the Red Queen. After all you have a nice castle, you should deserve to have a nice outfit too. This outfit is simple, comes with only a few pieces, but definitely more than enough to look the part good. And nobody told me there was a tea party! Well, I guess I will just have to invite myself to the party. And where is everyone when Kitty is dressed up pretty and nice for the party? That is it! This is a long way home and there is no proper transport. When I find out who organized this illegal party... Off with their heads! 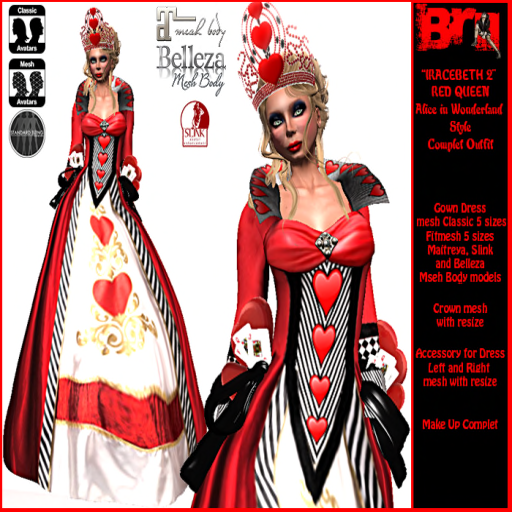 Meanwhile, you can join Kitty in Wonderland (and chopping heads perhaps) as the Red Queen when you find the Iracebeth outfit at $1L. The hunt item is huge, so I am sure you will not miss it.